Before remodeling, consider choices such as green-certified cabinets, energy-efficient appliances and countertops made from eco-friendly materials. Ready to remodel that kitchen? Think green. There are many reasons for creating a greener kitchen – from creating a healthier home and saving money to protecting the environment. Whatever the reasons and goals are, there are more options than ever now available. Chuck Homan of Homan Inc., a Certified Green Professional, says most of his clients don't initially approach him for a "green" kitchen remodel. Instead they want more energy-efficient appliances or sturdier cabinets that contain no or low VOCs (volatile organic compounds) which are emitted as a dangerous gas from the glue in certain particleboard cabinet materials. "They are asking for these components of green building without ever realizing they are building green," says Homan. Homeowners are usually financially conscientious when planning a kitchen remodel and it turns out that they are being environmentally conscientious as well. As you plan your next kitchen remodeling project, here are some green tips from the pros. "The kitchen is the heart of the home," says Carolyn Foelsch, owner of Kitchens & Baths by Design in Fairbanks and another Certified Green Professional. "It's where everybody wants to be, it's where all the action is." As a result of all this activity, the average kitchen uses a tremendous amount of energy. Kitchen lights, refrigerators, and cooking appliances alone are responsible for more than 40 percent of energy consumption in the home, according to the US Department of Energy. Old appliances, for example, can be huge energy suckers. Consider installing new Energy Star appliances, which use less energy and water than standard models. "A new dishwasher can save oodles of water," Foelsch notes. "Some use as little as 3.5 gallons per cycle and some can go as high as 12 gallons. And they're also making them not as hot – 120 degrees instead of 140 – which takes less hot water." Homan offers the cool fact that upgrading from a 1980s refrigerator will "save you $100 a year, and from a 1970s refrigerator, $200 a year on a electric bill." "As far as cooking appliances go," says Foelsch, "gas ranges and ovens are the most efficient and induction is even more efficient. But people are a bit afraid of those and you may have to buy special pots and pans to use them." However, affordable cast iron is compatible with induction cooktops that use electromagnetic energy to transfer heat to a pot or pan. Good insulation and quality windows are a must for conserving energy during cold Alaska winters, and ample and efficient lighting also plays a big role during these darker months. Incorporating a huge walk-in pantry in your kitchen is not only great for storage, but it also "allows you to have fewer cabinets and more windows, which allow more sunlight," says Foelsch. "Twenty-percent of energy comes from lighting in a kitchen project." All the experts interviewed recommend swapping out incandescent bulbs for compact fluorescents or LED bulbs that save both energy and money while lasting for years. Homeowners are recognizing that countertops made from renewable resources are just as beautiful and durable as mined stone. "Linoleum has made a huge comeback in recent years," says Foelsch. "There are lots of different colors and it's made from renewable resources like pine oil, cork and linseed oil. Some of it can look like granite too." Foelsch also cites other eco-friendly countertop options such as recycled glass tiles, bamboo and a new product called "PaperStone," a solid surface, heat-resistant product that is "made from 100-percent recycled paper." And "concrete is awesome!" she says. "It's very environmentally friendly and popular. You can be pretty creative with it." Newer, green-certified cabinets will contain no or low VOCs, and they are made better, too. "It's important to use quality materials," Homan says. "From a green standpoint you're not having to rebuild again." 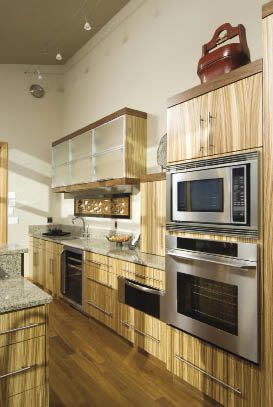 Foelsch suggests switching to bamboo cabinets, which are very sustainable, or wheat board, made of recycled stalks and straw. Or use sustainable woods like maple and cherry. The green flooring choices available today will have homeowners walking on air. Everything from reclaimed and sustainable woods (look for the 'FSC' label on wood products) to colorful tiles to linoleum are green-friendly. Many home remodels waste large quantities of materials during demolition. Consider recycling any materials that you are removing from your home; otherwise, they may all end up in the dump, notes Stacey Dean, owner of Grayling Construction and a Certified Green Professional. Some items can be resold. "We recycle a lot of the old materials," she adds. "The cabinets and the old appliances we'll donate to ReStore, a part of Habitat for Humanity." ReStore is a retail facility in Anchorage that accepts donations of new and used building supply products and appliances and all the proceeds go toward funding Habitat for Humanity projects. "Probably 90 percent of the products that we get would otherwise end up in the landfill," says the store's manager, Colin Hogan. "We kept 108,000 pounds out of the landfill just in May of this year." Green construction is fast becoming the norm in all construction, says Chuck Homan. "Most manufacturers are now building products from sustainable materials and I'm not having to go out and look for them," he says. "In a number of years, it'll be the standard way of doing things."